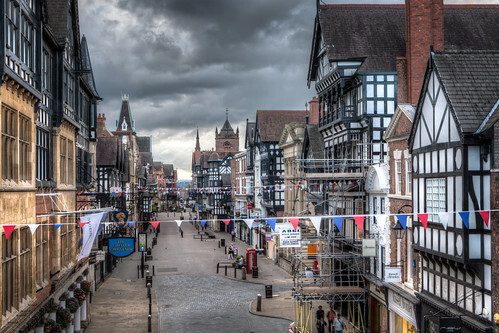 Eastgate Street 2012, Chester, a photo by Mark Carline on Flickr. St Michaels church at the cross still has it's C19th nave, and the eastgate indoor market buildings can be seen east of that. most notable it's the roofscape - premodern, flat roofs and mscps. 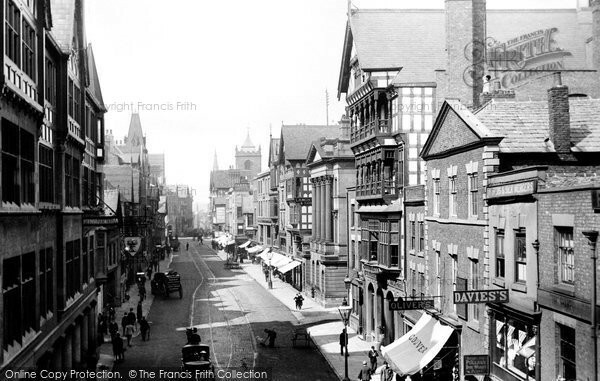 Next, you see the lanes, parallel with and behind the main streets, with their, often since lost, numerous enfronting buildings. The void that became the c20th Kings sq is there, and you can make out many still extant build ins, including the New Inn on Northgate Street. This site helps me to write my essays on this theme.